Hard to be judgmental about this one because it is so common – the "OMG tattoo." Virtually everyone who gets it done should admit that their reasons to tattoo start with the hope of drawing attention to themselves on some level. "What the HELL is that? Hahaha!" If it’s something to enhance your looks or a certain image you want to project, nothing says “Hey…check this out!” like sporting some sweet ink! I have found my own tattoos to be excellent ice-breakers with folks I didn’t know. Once you’ve finished telling the story of your ink, and they tell theirs (or what they like about yours), you’ve begun a rapport with someone new. 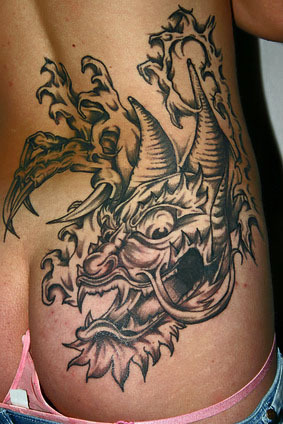 This category, number 2 in our Top 10 Reasons to Tattoo, covers a wide swath of those with ink. Obviously, the more brazen among us get the most attention with the really BIG "wow tattoos." Facial ink would definitely fit this category (see the image at top left of this page) – but I'm sure you would agree that they are not for everyone. "People get them for different reasons. Also depends a lot on their age group. The big thing with kids is quotes. Boy, are they ever gonna be sick of what they say, after they've explained them to a million people." "All of my tattoos mean something to me. I got them for sentimental value, along with aesthetic value. People who get tattoos for attention are the ones who end up regretting them. People who get meaningful tattoos are the ones who don't." "Why else would they want the tattoo?... Many of those who have several tattoos on their arms will begin to wear sleeveless shirts when previously they never did...I claimed that it was because I wanted to be an individual and to express myself, but in reality, I just did it for the chicks. Some high school chicks dig rebellion." As mentioned before, your ink is your mark and it can be great for just showing the world who you are and what you're all about. It doesn't have to meet the "OMG tattoo" criteria. Okay...so maybe just a little bit.